Baal HaSulam, “Introduction to the Study of the Ten Sefirot“: ‘The wicked, in their lives, are called “dead.”’ This is because their death is better than their lives, as the pain and suffering they endure for their sustenance is many times greater than the little pleasure they feel in this life. If we don’t advance towards attaining the source of life, then life turns into an escape from sufferings. All our thoughts are only about how to avoid evil and unpleasantness. Therefore, we don’t imagine the good as a filling, since we cannot fill ourselves, but simply try to find some peace between the bad moments. As a result, all the pleasures that we feel don’t last more than a short while, and so we are called “dead” even while we are alive, since we don’t receive a filling from the real source of life upon which all of reality and all of creation stand. Of course, everyone has his own accounts, and if he sees how much pain and suffering he feels, how much he suffered and what efforts he has made compared to the few moments of pleasure that have made him happy and brought him joy, then he discovers that it wasn’t worth living. This whole life can only be justified as a preparation for the spiritual ascent. But if one examines this life as is, there is no point to it. Now when we are awarded the Torah and Mitzvot (commandments), we are awarded with the real happy and joyful life by keeping them, as it says: “Taste and see that the Creator is good.” This is what those who have attained it feel. Then we can choose between good and evil. After we receive the Torah, the way, the spiritual principles, we begin to work with the two lines. This is how a person perceives the difference between life and death: Life means spiritual advancement, and death means lack of advancement. A person gradually understands that advancement means getting closer to love, to bestowal, to self annulment, to rising above one’s ego. Only this is called “life,” without any account of what we feel in our egoistic desires. Why Do Our Desires Lag Behind Life? Question: Why do we speak about the end of the consumerist society? Why does the era of consumerism have to come to an end? The first reason is external: We are running out of natural resources. The second reason is internal and it is the main reason: Our desire is changing—the foundation of human nature. We can analyze economic theories, propaganda, and advertising, we can invent different tricks and technologies, like three-dimensional movies, but all that will not help. A person will simply lose interest in it, like a cat that doesn’t care about the TV set it is lying on. Instead, we will simply pay more attention to society, to those around us. All this is because the desire is changing. There is nothing we can do about it, since it is desires that motivate a person. This, of course, will not happen all at once. Today it is still possible to promote consumerism by different “special offers.” Still, compared to the past, things are changing. The rate of suicide and divorce is rising, and disappointment and despair are spreading. It is in fact the beginning of a new trend. A person, of course, will still need food and other basic necessities, but the problem is not in such things, but in the desires that we are using incorrectly. One way or another, the desire is changing very slowly. The question is why does it lag behind the parallel external changes? Why do we encounter problems like the crisis if instead we can leap to a new level by a quick change of our desire? Isn’t it better for people to switch from consumerism, to more social activities of their own freewill? Why do they still want to buy like before, although the previous system is collapsing? The reason is that this is how they will recognize evil, so that the current situation will leave a bad taste. Otherwise, they will find a vessel, the desire, for something else. They have to feel that they are in despair—that the world is full and at the same time that it is empty. If the previous desires simply disappear, a person will not learn a lesson from the past and will not understand the problem. Therefore, the desire is changing much more slowly than the external conditions. These conditions have to pressure us and gradually evoke the right response. Then integral education appears, which explains that the desires in excess of the animal level, meaning basic, rational needs, can be met only in the context of human relationships. The current crisis is meant to show a person that he can meet his needs only in a new integral way. By that, his desires are not restricted, but they actually improve, become updated, and rise to a higher qualitative level. Then he will not settle for something transitory and ephemeral, but only for something that is more emotionally meaningful. A person develops, becomes sensitive to, and wants to enjoy other experiences, which are closer to spirituality. So it is actually in personal relations, in the family and in educating children that the current crisis is revealed most intensively. Are The Exact Sciences Really So Exact? The wisdom of Kabbalah tells us about its research from its discoveries, from what actually happens. Kabbalists discover reality as they change their vessels, their desires, and their perceptions, and therefore, there are no different voices or different opinions. It is about facts. It is the same in physics and in chemistry—every scientist can repeat a certain experiment or another and find out that under certain conditions a certain natural law works in a certain way. It is the same in Kabbalah; different people observe the same natural phenomena. In philosophy, however, everyone establishes concepts based on his own assumptions, in fact, claims whatever he feels like. So today it is clear that you cannot count on philosophy. On the other hand, Kabbalah in the modern integral world reveals itself as a true science. The newest approaches such as quantum physics and nanotechnology are nearing what Kabbalah discovered ages ago. But ordinary science is facing a great problem. If on one end of the scale philosophers can openly publish their fantasies, we discover scientific data in vessels that are our desires as an unquestionable fact. We are sure the world is as we see it. But at the same time we don’t take into account our five senses—it is as if they don’t exist, as if they don’t distort the picture of our reality. Science in this world is limited since it is based on the “animal” perception and studies data that come through its five channels. The wisdom of Kabbalah, however, uses a much more rigid approach. It isn’t based on man with his five corporeal “animal” senses, but rather allows him to open a new sense, that is external to our body, to come out and to rise above one’s self. This sensory organ is indeed “outside our body”—which means outside our egoistic desires. It is made of a Masach (screen) and Returning Light. In it, a person perceives the external reality and discovers that it is the Light or the Creator. After all, the desire itself is not a vessel yet. A “vessel” is a desire that is corrected by the altruistic intention that is meant to respond to the Light. One way or the other, everything takes place in the desire to receive that develops the ability to work as if outside the Masach and the Returning Light. All the impressions and the outlines, or whatever we may call them, remain in the desire. In the desire we conduct our research; we change it, and according to these changes, discover reality. I don’t know about anything that is on the outside. I am closed within my vessel until the end of correction. And as to what comes afterward, we don’t speak about it at the moment. Answer: To connect with the friends’ sparks means to connect our desires to the Creator. After all, the friends have come here since there is a spark in their great desire that yearns for spirituality, for equivalence of form and connection with the Creator. I am also here because of that desire; it is what has brought us to the group. We have to connect in these desires, to connect only by the reasons that have brought us here. Let’s take only the ones that have brought us here out of all the thickness of our desires and discard all the rest like a bag full of liquid garbage, and connect the sparks from which our spiritual vessel will be created. It will be only its upper part, and everything else is formed from the garbage we have discarded when we have annulled these desires. It isn’t easy to discard them, since we have to annul each of these desires one by one. When we try to connect and want to love, hate is suddenly revealed in order to show us that there is no natural love in us. In the meantime it seems that you love everyone naturally and that you treat everyone nicely, as is accepted in our world—they don’t work on love and so they don’t discover hate. In order to reach love, we must first discover the opposite—hate. But we don’t work on hate, we aspire for love, the more you yearn for love and really work on it, the faster you discover that you hate and that you don’t love. You are told the truth from Above. To discover love means to see the friend as the greatest in our generation, and to look only for the positive attributes in him, to try and feel that his desires are more important than your desires, just like a mother feels towards her child. Why Are The Rioters So Aggressive? In the News (from news.com.au): “Scientists from the University of Washington are conducting experiments to discover whether the universe exists within a Matrix style computer simulation created by supercomputers of the future. “The experiment could prove that we are merely pawns in some kind of larger computer game. “So who created these super computers that may hypothetically power our existence? “Professor Martin Savage, one of the physicists working on the project says it’s unclear. “In a nutshell the physicists will be looking at the distribution of the highest energy cosmic rays in order to try and detect patterns that could suggest that the universe is the creation of some futuristic computer technology. My Comment: Kabbalah reveals the program of creation of our world; we have to master it, and change ourselves according to it, to reveal the creator of this program—to understand his intention, reasons, and goals. And then, after the correction, meaning full mastery of the properties of the program’s creator, to develop outside the “matrix”—in the world of infinity, that is, unlimited possibilities. How Firm Is Our World? When we begin to mutually feel one another like a mother feels her child at a distance, and even much greater than that, then there will simply be one permanent worldwide convention. Question: You said that a person should turn to the Creator through the group. What does that mean? Do we have to read Shamati together or have a workshop: what should we do? Answer: I think that a person should behave very simply: First to take a short course in the wisdom of Kabbalah and then to study in a group. He has to participate in our lessons as much as he can, at least in the third part of the lesson, and to participate in workshops several times a week—that’s the least he can do. Besides, we have a huge library, an archive of lessons and talks translated to many languages. It shouldn’t be a problem to find something to do. A person should dedicate a certain amount of time to dissemination, since by that we not only bring our message to the world, but also join the next level. We have to bring humanity the information about the correction, the advancement, and the attainment of the next state. Otherwise how can we erase the deficiency that is now being revealed in people? We speak about the fact that there is none else besides Him. So what is humanity’s problem? How can it correct itself? 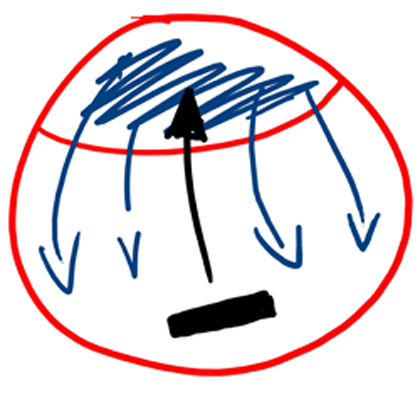 We have now reached a “round” state, in which we totally depend on one another. The third phase is now being revealed and we are beginning to ascend to it from our current state; this is called a crisis. The truth is that a “crisis” in Greek means “birth”—the birth of something new. So we have to show humanity that we are on the border of a new world now and this new world is integrality. 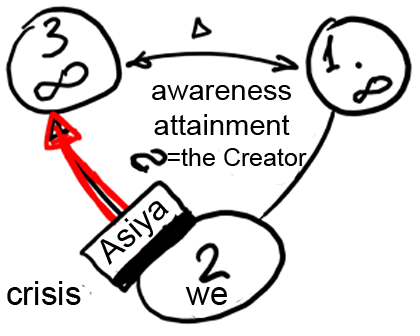 The first spiritual level, the world of Assiya, is now being revealed only in its external outline, integrally, since the spiritual world is integral. We are starting to see that with our properties, we are unable to cope in this system. A network of absolute mutual connections is descending upon us, and we cannot do anything here. This is precisely how today’s crisis is expressed in education, in science, in economy, in every aspect. So we first have to tell people about this, and second, to teach them the method of how to ascend internally to the next qualitative level, which means to change towards integrality, towards a mutual connection. The Baby Wants To Grow!